Many people associate long-term care insurance with nursing homes, but it also pays for in-home care and assisted living facilities. According to the American Association for Long-Term Care Insurance, 50 percent of long-term care insurance benefits in 2011 went to pay for in-home care, 31 percent for nursing home care, and 19 percent for an assisted living facility. Each long-term care insurance policy is slightly different, but most benefits kick in based on a similar definition of "disability": either you have severe cognitive impairment or you need help with at least two daily living activities. These activities include bathing, dressing, eating or using the bathroom. In other words, you don't just automatically receive the benefits when you think you could use some help or when you move into a retirement community. Policies are typically purchased with fixed daily benefits for a fixed period of time such as three years or five years. Can You Cover These Costs Without It? On an hourly, daily and monthly basis, the cost of the kinds of services covered by long-term care insurance really add up. 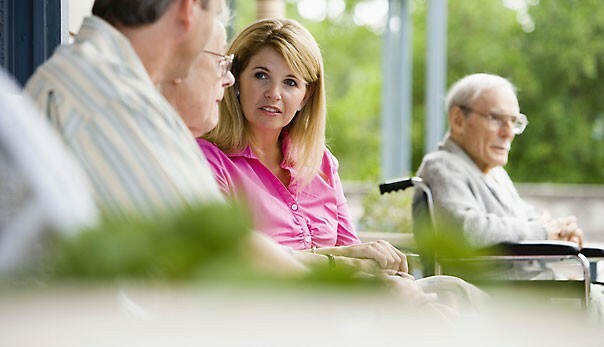 The national average monthly base rate in an assisted living community cost $3,550 in 2012. The national average daily rate for a private room in a nursing home cost $248; a semi-private room ran $222 per day. The national average daily rate for adult day services was $70. The national average for hourly rates for home health aides was $21. While many people recognize the value of having insurance coverage to help pay for their care when they age, not everyone purchases it. A 2012 Generational Research project by Financial Finesse showed that just 10 percent of people age 45 to 54 have purchased long-term care insurance, and only 16 percent of people age 55 to 64 have it. Why are people forgoing coverage? It comes down to cost, according to the AARP. Long-term care insurance can vary widely depending on your age at the time of purchase, the length and amount of coverage, and policy characteristics including whether your benefits are adjusted for inflation and the length of any waiting period before benefits are paid, among other things. According to the American Association for Long-Term Care Insurance, the average annual premium for long-term care insurance in 2012 for a policy for a 50-year old with a daily benefit of $200 for three years of coverage and a 3 percent automatic compound inflation coverage was $2,235. Your policy can't be cancelled (except for non-payment) and premiums for long-term care insurance cannot be increased on an individual basis for your age or health reasons. Still, insurance companies can raise the premiums for an entire class of policyholders (such as everyone age 75 and older). Obviously, the older you are when you purchase long-term care insurance, the more expensive the policy and the higher the likelihood that you will be turned down for the coverage. Underwriters look at your health records as well as mortality risk to determine your eligibility for coverage. Some companies give you a discount if you're married because they assume spouses are likely to take care of each other longer before resorting to a nursing home. How much longer we're living these days. The longer you live, the higher your chances of needing some type of long-term care, either in your home, in a nursing home or in an assisted living facility. Rising health care costs. AARP says that health care costs have historically outpaced the overall rate of inflation. If you need to live in a nursing home for more than a year or two, you could need $250,000 or more to pay for it. How far your retirement investments will really take you. Your 401(k) may look good when you retire at 65, but if you need to pay for assisted living or even a home health aide the income generated by your retirement investments could get eaten away very quickly. If one spouse needs to live in a nursing home but the other can stay at home, you'll need enough savings to cover two separate living expenses. Your family's emotional and financial health. Even wealthy families often choose to purchase long-term care insurance because the policy can make decisions about how to care for loved ones easier by giving them more options. Instead of draining their inheritance, your family members can use insurance benefits to pay for home health care or to cover some of the expense of a more costly nursing home. Financial experts suggest purchasing long-term care insurance between age 55 and 64, but remember that the younger you are when you buy it, the lower your premiums will be. If you or your parents are 50 or 55, it's time to discuss your options with an insurance agent.